Runes are the letters in a set of related alphabets known as runic alphabets, which were used to write various Germanic languages before the adoption of the Latin alphabet and for specialised purposes thereafter. 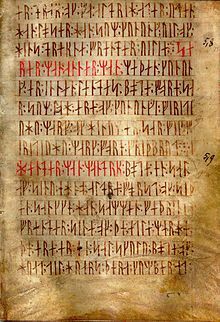 The Scandinavian variants are also known as futhark or fuþark (derived from their first six letters of the alphabet: F, U, Þ, A, R, and K); the Anglo-Saxon variant is futhorc or fuþorc (due to sound-changes undergone in Old English by the names of those six letters). 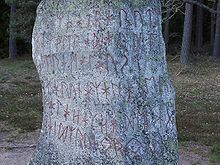 The runes were in use among the Germanic peoples from the 1st or 2nd century AD. [a] This period corresponds to the late Common Germanic stage linguistically, with a continuum of dialects not yet clearly separated into the three branches of later centuries: North Germanic, West Germanic, and East Germanic. The term runes is used to distinguish these symbols from Latin and Greek letters. It is attested on a 6th-century Alamannic runestaff as runa and possibly as runo on the 4th-century Einang stone. The name comes from the Germanic root run- (Gothic: 𐍂𐌿𐌽𐌰, runa), meaning "secret" or "whisper". In Old Irish Gaelic, the word rún means "mystery", "secret", "intention" or "affectionate love." Similarly in Welsh and Old English, the word rhin and rūn respectively means "mystery", "secret", "secret writing", or sometimes in the extreme sense of the word, "miracle" (gwyrth). 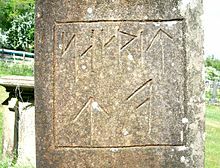 Ogham is a Celtic script, similarly carved in the Norse manner. The root run- can also be found in the Baltic languages, meaning "speech". In Lithuanian, runoti means both "to cut (with a knife)" and "to speak". 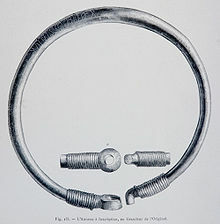 According to another theory, the Germanic root comes from the Indo-European root *reuə- "dig". 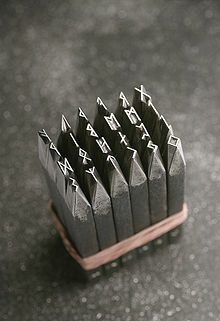 The Finnish term for rune, riimukirjain, means "scratched letter". The Finnish word runo means "poem" and comes from the same source as the English word "rune"; it is a very old loan of the Proto-Germanic *rūnō ("letter, literature, secret"). Specifically, the Raetic alphabet of Bolzano is often advanced as a candidate for the origin of the runes, with only five Elder Futhark runes (ᛖ e, ᛇ ï, ᛃ j, ᛜ ŋ, ᛈ p) having no counterpart in the Bolzano alphabet. Scandinavian scholars tend to favor derivation from the Latin alphabet itself over Raetic candidates. A "North Etruscan" thesis is supported by the inscription on the Negau helmet dating to the 2nd century BC. This is in a northern Etruscan alphabet but features a Germanic name, Harigast. Giuliano and Larissa Bonfante suggest that runes derived from some North Italic alphabet, specifically Venetic: but since Romans conquered Veneto after 200 BC, and then the Latin alphabet became prominent and Venetic culture diminished in importance, Germanic people could have adopted the Venetic alphabet within 3rd century BC or even earlier. The "West Germanic hypothesis" speculates on an introduction by West Germanic tribes. 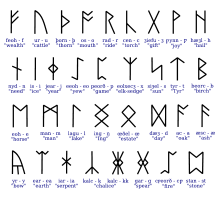 This hypothesis is based on claiming that the earliest inscriptions of the 2nd and 3rd centuries, found in bogs and graves around Jutland (the Vimose inscriptions), exhibit word endings that, being interpreted by Scandinavian scholars to be Proto-Norse, are considered unresolved and long having been the subject of discussion. Inscriptions such as wagnija, niþijo, and harija are supposed to represent tribe names, tentatively proposed to be Vangiones, the Nidensis, and the Harii tribes located in the Rhineland. 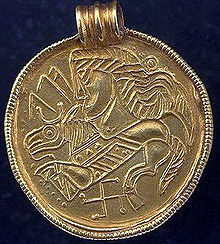 Since names ending in -io reflect Germanic morphology representing the Latin ending -ius, and the suffix -inius was reflected by Germanic -inio-, the question of the problematic ending -ijo in masculine Proto-Norse would be resolved by assuming Roman (Rhineland) influences, while "the awkward ending -a of laguþewa may be solved by accepting the fact that the name may indeed be West Germanic". In the early Runic period differences between Germanic languages are generally presumed to be small. Another theory presumes a Northwest Germanic unity preceding the emergence of Proto-Norse proper from roughly the 5th century. [b][c] An alternative suggestion explaining the impossibility of classifying the earliest inscriptions as either North or West Germanic is forwarded by È. A. Makaev, who presumes a "special runic koine", an early "literary Germanic" employed by the entire Late Common Germanic linguistic community after the separation of Gothic (2nd to 5th centuries), while the spoken dialects may already have been more diverse. A recent study of runic magic suggests that runes were used to create magical objects such as amulets,[page needed] but not in a way that would indicate that runic writing was any more inherently magical, than were other writing systems such as Latin or Greek. 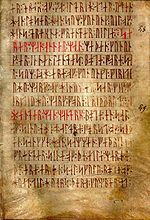 Codex Runicus, a vellum manuscript from approximately 1300 AD containing one of the oldest and best preserved texts of the Scanian Law, is written entirely in runes. Extra runes attested to outside of the rune poem include ᛢ cweorth, ᛣ calc, ᚸ gar, and ᛥ stan. Some of these additional letters have only been found in manuscripts. Feoh, þorn, and sigel stood for [f], [þ], and [s] in most environments, but voiced to [v], [ð], and [z] between vowels or voiced consonants. Gyfu and wynn stood for the letters yogh and wynn, which became [g] and [w] in Middle English. While also featuring a runic inscription detailing the erection of a bridge for a loved one, the 11th-century Ramsung carving is a Sigurd stone that depicts the legend of Sigurd. The Vimose Comb from the island of Funen, Denmark, features the earliest known runic inscription (AD 150 to 200) and simply reads, ᚺᚨᚱᛃᚨ "Harja", a male name. The Bluetooth logo is the combination of two runes of the Younger Futhark, Haglaz and Berkanan, equivalent to the letters «H» and «B», that are the initials of Harald Blåtand's name (bluetooth in english), that was a Denmark king from the viking age. Bluetooth logo with the initials of Harald Blåtand. ^ The oldest known runic inscription dates to around AD 150 and is found on a comb discovered in the bog of Vimose, Funen, Denmark. The inscription reads harja; a disputed candidate for a 1st-century inscription is on the Meldorf fibula in southern Jutland. ^ Penzl & Hall 1994a assume a period of "Proto-Nordic-Westgermanic" unity down to the 5th century and the Gallehus horns inscription. ^ The division between Northwest Germanic and Proto-Norse is somewhat arbitrary. 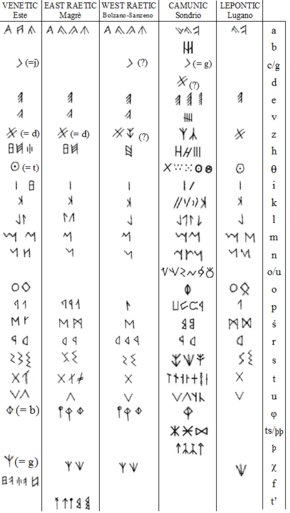 ^ Runic (PDF) (chart), Unicode . ^ Stoklund 2003, p. 173. ^ "Dictionary of the Lithuanian Language". LKZ. Retrieved 2010-04-13. ^ Dictionary of the Middle Ages (under preparation), Oxford University Press, archived from the original on 2007-06-23 . ^ a b Looijenga 1997. ^ Weisgerber 1968, pp. 135, 392ff. ^ Weisgerber 1966–1967, p. 207. ^ Syrett 1994, pp. 44ff. ^ Penzl & Hall 1994b, p. 186. ^ a b Antonsen 1965, p. 36. ^ "Runic alphabet", Encyclopædia Britannica, A likely theory is that the runic alphabet was developed by the Goths, a Germanic people, from the Etruscan alphabet of northern Italy and was perhaps also influenced by the Latin alphabet in the 1st or 2nd century BC . ^ a b "Hávamál", Norrøne Tekster og Kvad, Norway, archived from the original on 2007-05-08. ^ Larrington 1999, p. 37. ^ "DR 360", Rundata (entry) (2.0 for Windows ed.) . ^ MacLeod & Mees 2006, pp. 100–01. ^ Page 2005, p. 31. ^ Foote & Wilson 1970. ^ Foote & Wilson 1970, p. 401. ^ MacLeod & Mees 2006. ^ McDermott, Larissa (2016). Runes. 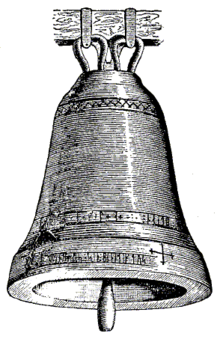 Lulu Press. p. 70. ISBN 9781365130724. Retrieved 2018-05-22. ^ William, Gareth (2007). West over Sea: Studies in Scandinavian Sea-Borne Expansion and Settlement Before 1300. Brill Publishers. p. 473. ISBN 9789047421214. Retrieved 2018-05-22. ^ "Vg 63", Rundata (entry) (2.0 for Windows ed.) . ^ "Vg 119", Rundata (entry) (2.0 for Windows ed.) . ^ Larrington 1999, p. 25. ^ a b Larrington 1999, p. 34. ^ Seigfried, Karl E.H. (Mar 2010), "Odin & the Runes, Part Three", The Norse Mythology . ^ Page 2005, pp. 8, 15–16. ^ Grimm, William (1821), "18", Ueber deutsche Runen [Concerning German runes] (in German), pp. 149–59 . ^ Jacobsen & Moltke 1942, p. vii. ^ Werner 2004, p. 20. ^ Werner 2004, p. 7. ^ Brix, Lise (May 21, 2015). 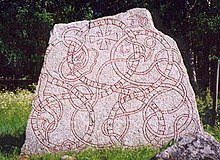 "Isolated people in Sweden only stopped using runes 100 years ago". ScienceNordic. ^ Looijenga, Tineke (2003). Texts and Contexts of the Oldest Runic Inscriptions. Leiden: Brill. p. 160. ISBN 978-90-04-12396-0. ^ de Gruyter, Walter (2002). The Nordic Languages, Volume 1. p. 700. ISBN 9783110197051. Retrieved 2018-05-22. Antonsen, Elmer H. (1965), "On Defining Stages in Prehistoric Germanic", Language, 41 (1): 19–36, doi:10.2307/411849, JSTOR 411849 . Foote, P. G.; Wilson, D. M. (1970), The Viking Achievement, London: Sidgwick & Jackson, p. 401, ISBN 978-0-283-97926-2 . Larrington, Carolyne (1999), The Poetic Edda, Oxford World's Classics, translated by Larrington, ISBN 978-0-19-283946-6 . MacLeod, Mindy; Mees, Bernard (2006), Runic Amulets and Magic Objects, Woodbridge, UK; Rochester, NY: Boydell Press, ISBN 978-1-84383-205-8 . Odenstedt, Bengt (1990), On the Origin and Early History of the Runic Script, Uppsala, ISBN 978-91-85352-20-3 . Page, Raymond Ian (2005), Runes, The British Museum Press, p. 31, ISBN 978-0-7141-8065-6 . Penzl, Herbert; Hall, Margaret Austin (Mar 1994a), "The Cambridge history of the English language, vol. I: the beginnings to 1066", Language (review), 70 (1): 185–89, doi:10.2307/416753, eISSN 1535-0665, ISSN 0097-8507, JSTOR 416753 . Gosse, Edmund (1911). "Runes, Runic Language and Inscriptions" . Encyclopædia Britannica (11th ed.). "Maeshowe: The Application of RTI to Norse Runes (Data Paper)", Internet Archaeology, 2018 .